Goodspeed's "Oliver! ": Feud, Glorious Feud! 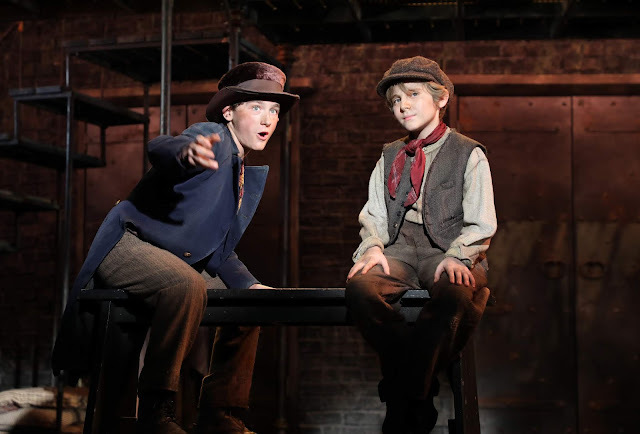 Gavin Swartz (The Artful Dodger) & Elijah Rayman (Oliver) in "Oliver!" 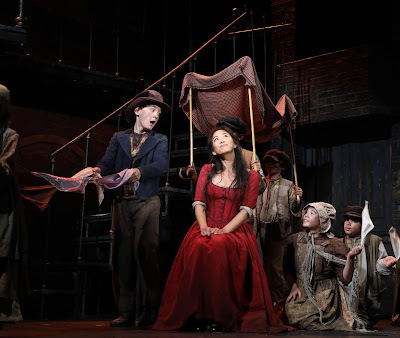 The stage musical version of Charles Dickens' Oliver Twist is infrequently produced these days, in large part because of the challenge of casting young actors. After all, the well-known story from Dickens' original novel features two different British social worlds engaged in feuding against one another for the life and soul of the titular orphan and involves a good number of workhouse young boys with two lead roles that are essential to the tale. When the London stage production debuted in 1960 in London, and two years later on Broadway, then in an Oscar-winning filmed version, the success of all these versions depended heavily on the charisma of the actors portraying the characters of Oliver and the Artful Dodger. Goodspeed Musicals in East Haddam, Connecticut has miraculously managed to discover two gems, namely Elijah Rayman (Oliver) and Gavin Swartz (the Artful Dodger), who together provide the foundation for a production that can only be described as virtually flawless, it surely deserves the exclamatory title, Oliver!. 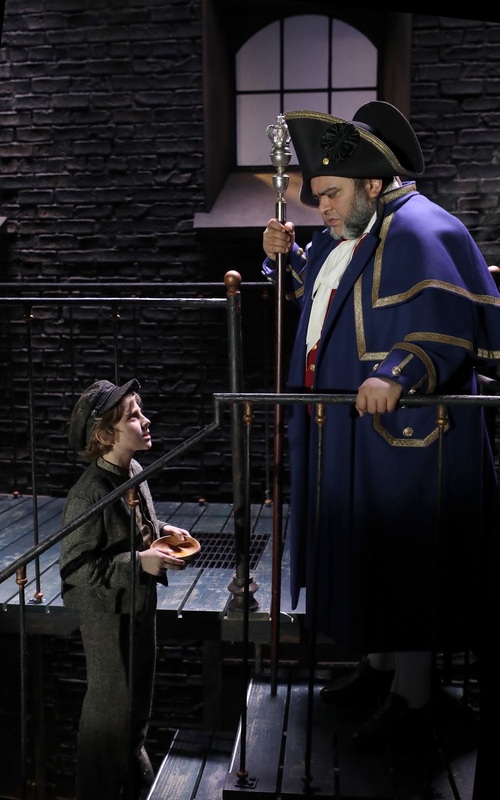 Gavin Swartz (The Artful Dodger) & EJ Zimmerman (Nancy) & Cast in "Oliver!" As crucial as these two actors are, any version of this musical further requires versatile singing, dancing and acting performers in the roles of the conniving yet captivating “receiver” Fagin (Donald Corren), the heartbreaking Nancy (EJ Zimmerman) who can belt the show's best rousing songs as well as a thrilling torch song or two, the inherently and unredeemably evil Bill Sikes (Brandon Andrus), and the hilariously hypocritical workhouse owners, the Bumbles (Richard R. Henry and Joy Hermalyn). They are, individually as well as collectively, about as professionally perfect as one could hope for, and that includes the entire ensemble. Rarely has one encountered such a capable Oliver as Rayman (often played by actors outside their range) or a more mesmerizing Artful Dodger as Swartz (arguably the show's best-written and here best-performed role). One can only marvel at how the company found all these pros. But wait, there's more. Elijah Rayman (Oliver) & Richard Henry (Mr. Bumble) in "Oliver!" That professional level goes for the creative team as well, especially with regard to the work of Director Rob Ruggiero (in his eleventh season with Goodspeed), who so impressed in the past with such productions as Rags, Fiddler on the Roof, La Cage aux Folles and The Most Happy Fella; there simply is no one on the planet so imaginative and focused as a musical stage helmer. Along with the stupendous Scenic Design by Michael Schweikardt and wondrous Costume Design by Alejo Vietti, terrific Lighting Design by John Lasiter and effective Sound Design by Jay Hilton, there is the marvelous Musical Direction by Michael O'Flaherty, fluid Choreography by James Gray and, at the core of the work, the triple threat contribution by the musical's creator Lionel Bart, who wrote the Book, Music and Lyrics (a feat perhaps only Frank Loessor or Meredith Wilson could so perfectly match). Not only was Bart true to Dickensian themes, his work was respected by Ruggiero with this tight rendition, with a helpful mimed visual to start the show, and the sight of a determined Fagin to end it, as opposed to the medley of reprised songs usually provided. And oh, that score! From the show's opener, Food, Glorious Food (with this production's sole flaw, the need for better ensemble diction) to Oliver's poignant plea Where Is Love? to Dodger's show-stopping Consider Yourself, to Nancy's As Long As He Needs Me and Oom-Pah-Pah, and Fagin's “eleven o'clock number”, Reviewing the Situation, it's chock full of unforgettable musical pieces. The score's sources range from the traditional British music hall to complex counterpoint sung a cappella, every song character-driven. Even Nancy's fate (with its abusive aspects) is here tempered by her strength and redeeming choices in the end. As is equally true in Dickens' seminal source, everything about a successful Oliver! demonstrates precisely how character-driven this work is at every level. Storytelling in theater simply doesn't get any better than this. Period. Full stop. And do by all means make a full stop at Goodspeed Musicals (already extended through September 13th) for this quintessential example of musical theater at its best, and, in the tradition of past exclamation-pointed shows (think Oklahoma!, Hello, Dolly! and the like) it's totally Broadway-ready. 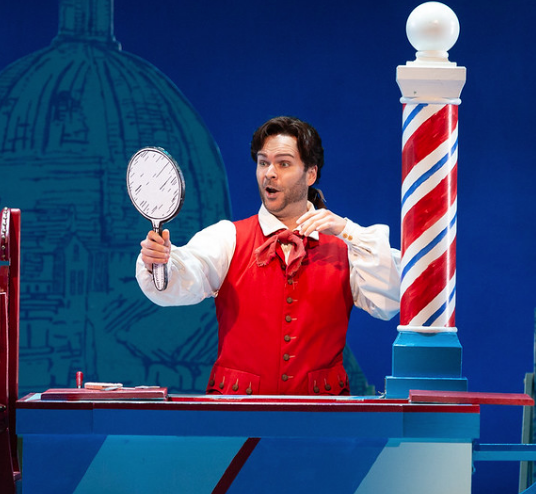 The contrast between the comic opera The Barber of Seville and the sobering opera Silent Night, both presented this past weekend as part of this year's season of the Glimmerglass Opera Festival, could not have been more pronounced. 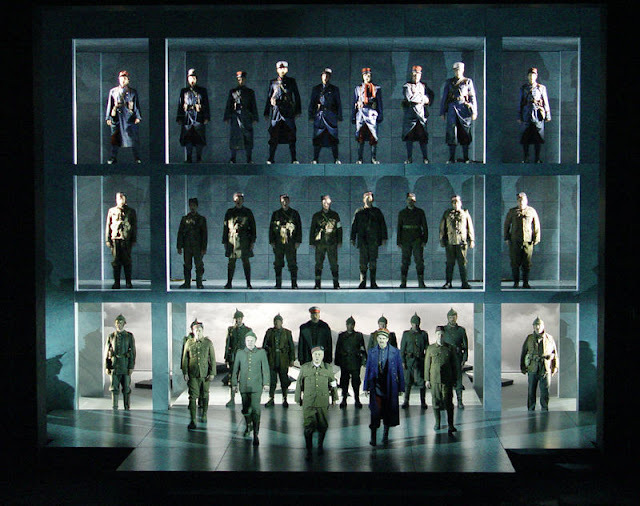 Yet it was a stunning demonstration of how each of these profoundly disparate operas may serve as a reminder of how the medium of opera can inspire in so many different ways, especially in the hands of brilliant directors. Though Cooperstown may perhaps be more famous for its Baseball Hall of Fame one could argue that it is equally renowned, at least among music lovers, for its annual Opera festival, since its founding in 1975. This year is no exception. The Cast of "The Barber of Seville"
﻿In the more familiar work, with its lively music by Gioachino Rossini and hysterical libretto by Cesare Sterbini, this version of Barber was imagination on speed, a virtually flawless romp with a plethora of truly funny comic touches, a non-stop cornucopia of visual treats. The direction, by the company's Artistic and General Director Francesca Zambello, was nothing less than astounding. If you think you've seen every possible production of this war horse, think again. It's rare that a much beloved work receives such a unified and original approach. This is reflected by the Costume Designer Lynly Saunders, Lighting Designer Robert Wierzel, Choreography by Olivia Barbieri, and perhaps especially Scenic Designer John Conklin (who gives a whole new depth to the term “two-dimension” (not to be revealed here). 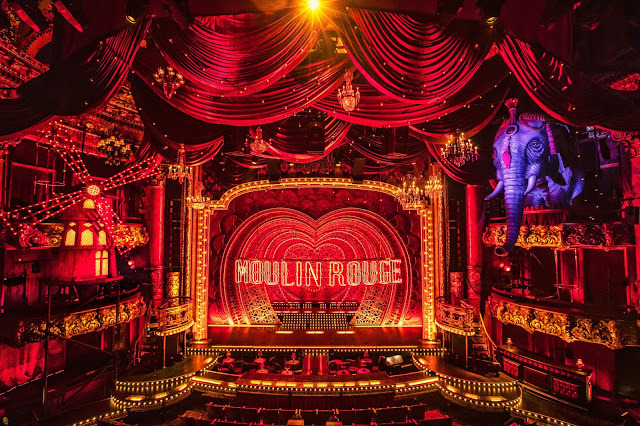 But the old saying correctly admonishes that you can't hum the scenery; it remained for the orchestra (under the magical touch of Conductor Joseph Colaneri) and cast to solidify all the stage business with musical and vocal precision. For all its apparent simplicity and ease, this is a challenging piece to perform, and the musicians both in the pit and on the stage didn't fail to deliver. Joshua Hopkins as Figaro in "The Barber of Seville"
The story is well-known enough to dispense with a synopsis, other than to note that it all revolves around the character of Rosina (here superbly played and sung by Emily D'Angelo), the almost universal object of affection of virtually everyone on stage, who is the ward of Dr. Bartolo (a true gem both in his acting and singing, Dale Travis). Count Almaviva (the wonderful David Walton), aided by Figaro (the hysterically comic Joshua Hopkins), is another suitor. The rest of the cast include Rosina's music teacher Basilio (the able Timothy Bruno), the maid Berta (Alexandria Shiner, with a lovely voice even in this relatively minor role), and the characters of Fiorello (Ben Schaefer), an Officer (Maxwell Levy) and Figaro's Assistant (Rock Lasky). And there's not a clinker in the bunch. One almost-spoiler: keep a lookout for how one character (the maid Berta) gives a clever new meaning to the term “disappearing into the scenery”. The Cast of "Silent Night"
There's no likelihood of anyone's disappearing into the scenery in the company's compelling production of Silent Night. The stark yet versatile style visually captures one's attention from the first moments of this startling contemporary work, complemented by yet another example of an ingenious director (Tomer Zvulun). 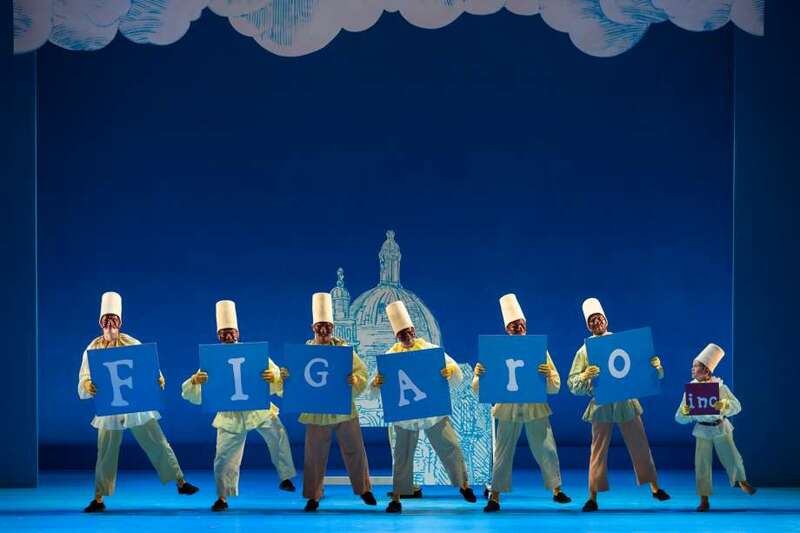 Based on a film by the same name, the operatic version was first performed in 2011. Its Composer Kevin Puts won the Pulitzer Prize for this, his debut opera; the Libretto by Mark Campbell (who impressed last season in Boston Lyric Opera's production of his Mr. Burke and Mr. Hare) is his third Pulitzer. It's easy to hear why, especially as led by Conductor Nicole Paiement. The music is lovely, melodic, and complex, and the story is enthralling. There are three stories, actually, taking place on a World War I Belgian battlefield on Christmas morning (in 1914): two famed German opera stars, also lovers (Arnold Livingston Geis as Sprink and Mary Evelyn Hangley as Anna), first separated, reunite for a command performance at a German officer's chalet nearby; the two Scottish Dale brothers, Jonathan (Christian Sanders) and William (Maxwell Levy), and their local parish priest (Wm. Clay Thompson), all enlist; and French Lieutenant Audebert (Michael Miller) also enlists though his wife is pregnant, and is given coffee by his aide-de-camp Ponchel (Conor McDonald). There ensues a brief truce, first as a respite for the holiday, then extended in order to bury the dead. Peace reigns ever so briefly, inevitably, as war must be resumed. And then in your grave. This version is blessed with a cast of astonishingly terrific singer/actors, especially those singled out by name above, and a creative team that has captured war in its most heartrending aspects, with lovers who are divided, brothers who are separated in the extreme sense, and an absurd death of a unfortunate soldier in the wrong place in the wrong time in the wrong uniform. 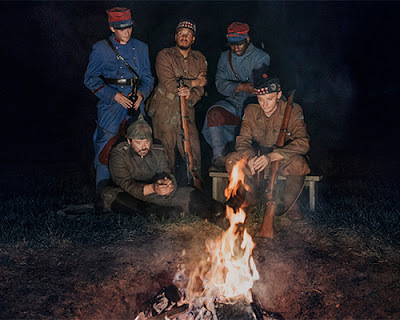 A word about those uniforms: though they are historically accurate, Costume Designer Victoria Tzykun has noted that she designs not costumes but characters. The scenery by Erhard Rom is an inspired choice to illustrate the triple nature of the conflict, and the Lighting Design by Robert Wierzel echoes this approach. In the end, with obvious resonance for the irrational times we live in, there are no winners, only losers, except one; war is the sole winner. If the current politically hot season (which seems endless of late) is getting you down, a trip to the Berkshires and the summer home of the Boston Symphony Orchestra at Tanglewood may be just what your therapist (who's probably on vacation anyway) might have ordered. When the headlines abound with disturbing news at home and abroad, one antidote sure to restore your flagging spirits is to resist via the arts, which have always managed to provide restoration as well as response to the turmoil. 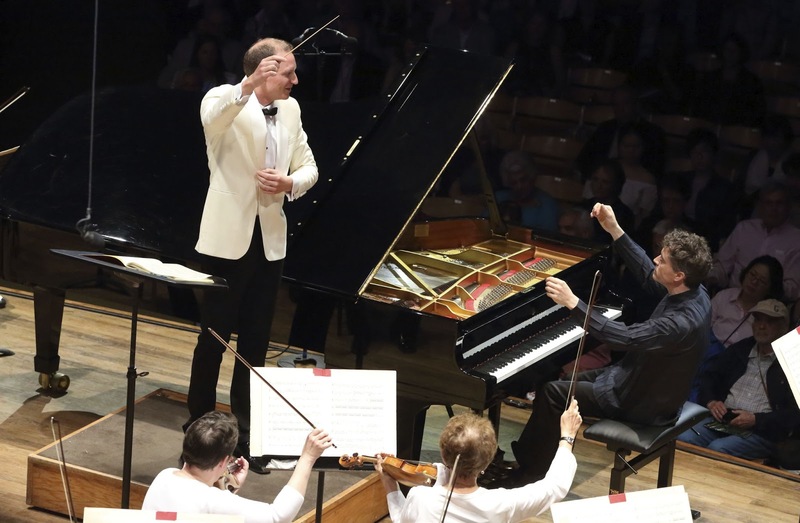 On a warm summer's night, that was indisputably provided by the BSO's triple play of Wagner, Mozart and Schumann. Rest assured that even with these heavyweights on offer, the balm and calm quotient was well provided, in that the pieces chosen were (for these composers, anyway) atypically light and refreshing, beginning with Siegfried Idyll, with Wagner at his most approachable and beloved. One doesn't have to be a classical music scholar to discern that this work was first and foremost a labor of love, even if one isn't familiar with its history, which is undeniably charming. Its first performance was on Christmas morning in 1870 as a birthday present from Wagner to his wife after the birth of his only son. As a curtain raiser, it perfectly set the mood for what was to follow. From a century earlier, the Mozart choice was his Piano Concerto No. 27 in B-flat, which was first performed in 1791, and was first performed by the BSO (at Tanglewood, no less) in 1963. Though often referred to as “autumnal” (including in this performance's program notes) it was a wise choice to continue the night's thematic purpose, as its melodious expression was again indicative of the power of music to move and inspire. It's Mozart at his most direct and simple, even sublime. Beautifully led by Moritz Gnann (now completing his third season as the BSO's assistant conductor), as was the whole program, this piece was enhanced by the remarkable playing of pianist Paul Lewis, who next month will be commencing a multi-year survey at Tanglewood in works for the piano by Haydn, Beethoven and Brahms. He managed to enhance the effect of the piece precisely by deemphasizing more virtuosic technical displays, proving that often less is more. If this performance was any indication, this should be a fascinating project indeed. The third and last piece, Shumann's Symphony No. 3 in E-flat, Opus 97, a much more positive work than the composer is famous for, accounting for its common subtitle, the “Rhenish” Symphony, with its warmth and colorful imagery of the Rhine River. Though the composer never attributed the name, it's clearly appropriate with its easily applicable pictures of the flow of the mighty river, especially when juxtaposed with compositions created during his more melancholy and unstable periods. It's atypical even in its format, with a total of five movements rather than four. As noted, it was a pluperfect presentation of music that fit the occasion and the season. But it is by no means the last. Coming weekend programs will include Glinka's overture to his opera Ruslan and Ludmila, Rachmaninoff's Piano Concerto No.2 and the complete Stravinsky Firebird; a Bernstein Songfest that will feature Nadine Sierra, Isabel Leonard, Kelley O'Connor, Nicholas Phan, Elliot Madore and Eric Owens, and Wieniawski's Violin Concerto No.2 with Joshual Bell; and a spectacular Bernstein Centennial Celebration with a host of conductors and performers including Audra McDonald, Midori, Yo-Yo Ma, cellist Kian Soltani, Nadine Sierra, Susan Graham, Isabel Leonard, and Thomas Hampson. What greater tribute could one ask for in this Year of Lennie? "Moulin Rouge!"..... now in previews at Boston's Colonial Theatre! As previously noted in a review of a recent regional production of Man of La Mancha , for theatergoers who were fortunate enough to attend productions of this 1959 “musical play” on Broadway, or one or more of its four New York revivals in 1972, 1977, 1992, or 2002, this show remains a beloved memory. Based on the 1965 novel Don Quixote (written between 1605 and 1615) as well as other works by Miguel de Cervantes, it was nominated for seven Tony Awards, winning five (including Best Musical). It had first seen the light of day as a non-musical teleplay by Dale Wasserman in 1959, later adapted by him for the musical stage (at Goodspeed Opera House, also the original home of Annie), with Music by Mitch Leigh and Lyrics by Joe Darion. 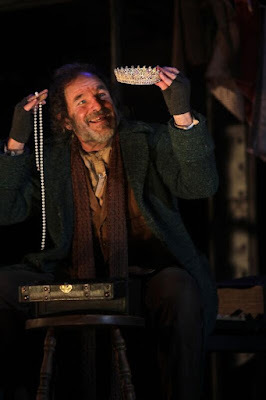 It was Wasserman's ingenious move to portray the eccentric title character in a play-within-a-play-within a play, a tribute to the historical fact that Cervantes himself, a contemporary of Shakespeare, was not primarily a poet but first and foremost a playwright and actor on the road with his own little troupe. This “musical play” reflected the idealistic hopes of the time, becoming known primarily for its best song, The Quest , also known as The Impossible Dream (especially among Red Sox fans in 1967). It was also acknowledged as providing one of the rare Broadway musical male lead roles, along with the likes of Tevye and Harold Hill. It survived its being made into an almost completely forgettable film in 1972 starring Peter O'Toole and Sophia Loren, neither of whom could carry a tune in the proverbial bucket (only O'Toole was dubbed). The question for modern audiences is this: does it still speak to them as it celebrates idealism and hope, in a more cynical age? And what of the line (which obviously has quite a different connotation today): "facts are the enemy of truth"? Alas, the question remains unanswered, at least with Americana Theatre's current production, featuring a trial by the Spanish Inquisition (1478). One who had never seen a production of this show could be forgiven for not grasping the logic of the plot (and at times it is intrinsically illogical), with a weirdly unsettling sound that preceded the performance, consisting of water dripping that suggested Chinese water torture. At least in this production (as opposed to those other regional versions) the cast consisted of excellent actors in singing roles that were within their comfort zones. It also followed the explicit instructions by the librettist that Cervantes appear to grow old and gaunt (applying makeup and beard as he assumes the title role). But then there is playwright Wasserman's note that “the play is performed without intermission”, which, as with most versions lately, was ignored, leading to the breaking of tension. Interrupting the natural flow of the original text fails to grasp and/or convey the fundamental message of the piece, a message we could all use in these uncertain times. Once again these actors save the day, (as they did with last season's “Lucky Stiff”, a comparatively inferior work). Most notable was Bethany Lauren James as Aldonza, the whore who evolves into Dulcenea, the “noble lady” chosen by the knight-errant Don Quixote (Scott Wahle, who grew into the role despite technical sound issues). She becomes his sole convert, displaying the power the play should possess. Other standouts were Ruben Navarro as Sancho Panza and Derek G. Martin (also the show's choreographer) as the Padre. The creative team included Director Dr. Michael Kirkland, Music Director Nancy Sparklin, Scene Designer David Friday, Lighting Director Heather M. Crocker, Costume Designer Brian Kenerson and Sound Designer Gary Sjolin. This was another demonstration of the breadth and depth of this company, as cast members contributed additional creative input. One would be wrong, however, to mistake this as an indication of a Mickey-and-Judy putting-on-a-show effort. It's a well coordinated ensemble effort that's worth seeing and a revelation of what this company is capable of producing.